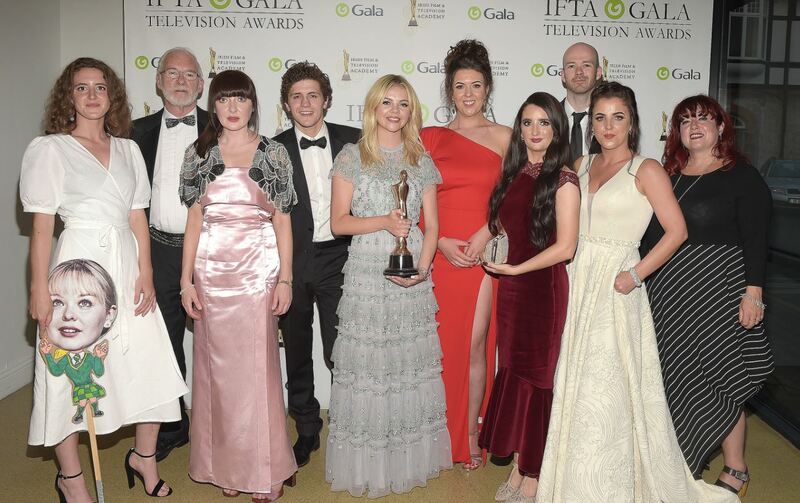 The creative force behind Derry Girls – Queen’s 2002 Drama graduate, Lisa McGee – won the IFTA Gala Award for Writer in Comedy or Soap at the 2018 Irish Film and Television Academy (IFTA) Awards held last night (31.05.18), at which the show also took home the Gala Award for Comedy! The runaway Channel 4 television hit, which was based on Lisa’s childhood growing up in pre-ceasefire Derry, had to see off The Young Offenders and Mrs Brown's Boys to win the coveted IFTA. Lisa McGee attended Thornhill College in Derry before going on to Queen’s to read Drama, where she first concentrated on writing. Early success with plays such as Girls and Dolls (which won both a Stewart Parker Award (2007) and the Blackburn Prize) were the first of many for Lisa on the road to the most recent IFTA double. After graduation in 2002, Lisa and three friends set up their own company – Sneaky Productions – which premiered a co-written piece Jump! which was later made into a film. Her impressive back catalogue also includes The Heights, Nineteen Ninety Two, The Opportunists and The Young Man with the Cream Tarts, while her writing for television includes: Totally Frank (Endemol, Channel 4) and The Things I Haven't Told You for BBC 3. Set in 1994, Derry Girls is based partly on Lisa’s teenage years in the 90s, growing up in the Maiden City and attending a Catholic convent school. It takes a caustic, irreverent and nostalgic look at life in the city, primarily through the eyes of a group of local female teenagers (there is only one young male character who is a mild-mannered cousin from England), living out what they see as ordinary lives. Derry Girls was filmed in July 2017, primarily in Derry, with each of the episodes featuring at least one Maiden City scene. Lisa’s old convent school, Thornhill College, was also the location for the fictional Our Lady Immaculate College. Over 2½ million viewers tuned in to watch the first episode of Derry Girls in January, making it Channel 4's highest-rated comedy launch in the last five years – and the biggest programme in Northern Ireland since records began in 2002 – so it was no surprise that a second series has been commissioned. Caption: Lisa McGee (5th from right), pictured with cast members from Derry Girls.